‘Crimson Queen’ is by far one of the most popular of the family of Japanese Maples. Lace-leaf and weeping with deep red color that holds well throughout the summer even in conditions of extreme heat, ‘Crimson Queen’ is a great addition to any landscape. This beautiful dwarf tree does well in zones 5 through 8. Although partial shade is often recommend for this tree, mine are in full sun and do quite well. Spring color is very, very red and as the summer goes on the color deepens to more of a scarlet red. The fall color, right before leaf drop is striking red. The photo to the left was taken in August after weeks of extreme heat and the tree still has good red color. New growth comes out with a beautiful red color so early in the spring the tree is very eye catching with it’s vivid red color. Regular pruning of ‘Crimson Queen’ Japanese Maple is essential in order to maintain the desired shape. Some people think all things should be allow to grow naturally and I’ve seen tree that have been allow to take that path. They look much more desirable when pruned on a regular basis. As you can see in this photo the new growth has a brilliant red color, but at some point before the next growing season that new growth needs to be removed. If it is not removed next spring when the tree leafs out additional new growth will appear on these two branches which already seem out of place. If pruned off before that happens all of the new growth next spring will cover the tree uniformly and tree will maintain it’s desired shape. This is pretty typical for most of the dissectum Japanese Maple varieties nearing the end of summer. It’s pretty common for the edges of the leaves to become dry and a tad crispy. By no means does this take away from the plant. Dissectum leaves are finely cut and very delicate and between the wind and the hot summer sun it’s like holding a blow dryer to the leaves. This is where some partial shading comes in handy, but it’s not really necessary. You have to look closely to see this condition and since this is a deciduous plant it’s just a temporary condition that does not affect the plant in a negative way at all. Crimson Queen displaying it’s beautiful red color in the spring. Beautiful tree! I enjoyed your video on youtube. I just planted two Crimson Queens and I am wanting upright growth like the one pictured. I noticed in your video you only staked the main runner? of the tree. On another web site it was suggested that all limbs pliable enough be tied upward which is what I did. I’m wondering what effect this will have? Also, how many inches of growth per year can I expect in zone 5 (Kansas City)? Is there anything I can do to speed the growth? Right now the trees are about 3 feet tall and I just planted them today so I can untie the smaller limbs if this was a mistake. What you did is fine, you’ll end up with a nice tree. You can expect between 6″ and 9″ of new growth each year. They are slow growing, but they fill in at the same time. Before you know it you’ll have a nice tree. Speed up the growth? That’s a dangerous question to answer. Japanese maples grow at their own pace. Trying to speed them up with fertilizer will do them a great deal of harm if not kill them. The best way to get the most growth possible is to make sure they are planted in loose soil that drains well and is rich in organic matter. If your tree is planted in heavy clay soil it is not going to be happy and will grow very slowly. Thanks for any advise you may offer! Hello, I purchased my second Japanese maple last year. The first was a small Garnett that died in its first year. Last year, I bought a 3′ tall crimson queen. I planted it at the end of April. I mixed a compost in this time because I felt that may have been the reason why the first one died. It was also recommended by the gardener at the nursery. Shortly after I planted the crimson queen, it began loosing its leaves. It kept about half of what it originally had through the year before it lost them all for the winter. This spring, it began to bud and leaves began to grow. I think it is not where it should be though. When I purchased this time last year, it was fully bloomed. In addition, there is another crimson queen in my neighborhood of similar size that is fully bloomed. I did a nutrient test on my soil and looks like every thing. Though I may try to boost my nitrogen levels. All of the other plants in the garden are doing great. Please help! Giving nitrogen to a Japanese maple is not recommended. It’s way too easy to apply too much and kill the tree. They only need three things. Good soil that drains well. Water as needed but excess must drain away. Do not plant in a wet area or in a bed where a downspout spills on to it. I have thousands growing in my nursery, they are doing great and they do not get fertilized. I had a beautiful Crimson Queen tree, approximately 6 yrs old. We moved and a large branch broke off but the tree still looked great. So it list its leaves in the winter and spring came and some branches had small leaves on them. Then those died. Now I have no budding or leaves coming out. Did I kill it? Something went wrong and most likely the tree is not going to make it. This is how you test to see if a plant, or a branch on a plant has died. Just scratch the bark of your plants with your finger nail. If the tissue below the bark is green and firm your plants are fine. If the tissue is brown and mushy that part of the plant is dead. We bought this house in November and the Crimson Queen appears to be well established. It’s beautiful. However, I am wondering about pruning the underside of the tree. The trunk is bare about 2-3′ up, as it should be, but you can barely see the trunk as the branches nearly reach the ground, particularly at the outside edges. It is about 5.5′ tall and probably the same in width. I see what you mean about new growth and will certainly prune that. But again, do you feel pruning from below is desirable or should I just leave it alone? Thanks so much for your help. Oh, and I’m in St Louis, Zone 5. Prune it all you want and time of year doesn’t matter. We prune ours on top, underneath and the sides. The more you prune the better it gets. I have 3 Crimson Queen Japanese Maples in my yard. Two are amazing and one looked like it was dead last year. We trimmed it of the dead branches and it is filling back in. Oddly, it is putting out Maple Tree branches that are five pointed, wider and green. What is going on and what should I do? I’d like to show you some pictures to be sure. How can I do that? I have a Crimson Queen that had a rough time last year. It has started growing new foliage but, some of the branches (about 10) look like regular Maple trees. What’s up with that and what should I do? I apologize. I see your previous reply. Why do so many branches on my Jm dissectum die and require cutting out? It is now 30 years. old. I may be moving to Phoenix, AZ in the near future. I love Japanese Maples, but it is so hot in the Summer. Will Crimson Queen survive there under any circumstances? Are any Japanese Maples more suited for hot weather? Do you have to keep them in pots and under a patio cover or can any be planted with partial shade. Or is it just plain too hot? Thanks. I just purchased a 3 foot “Crimson Queen” which will be planted in a large pot in an East facing place on my deck, it will not get afternoon sun. I need help in planting and want to get the maple off to a good start. Can anyone share their wisdom? The nurseryman told me to use a product called “Sure Start ” when planting. I have a crimson queen tree. During the summer, my tree was full and beautiful. It is about four years old. But, at the end of summer, the leaves were dry. They never fell off this year nor, do they have new buds. I an fearful that it has died. Can you give me any other reason for this? Thank you! Will this Crimson do well in zone 16? Planning on purchasing a Crimson Queen as a center piece for a planting bed near the entrance on out home. What is the largest specimen that you sell? am I too close to the beach to grow a dwarf Japanese under my house? I live 4 rows back from the beach in southeast Texas (9a)? Our house is on pilings and I plan on keeping them in containers so it will get a little light, but I don’t want a big one, I want a dwarf. All you can do is try but I don’t think you have a long enough dormancy period for a Japanese maple to do well. I live in Central Mississippi and just bought a crimson queen to plant i have planted many and they never do very ell and eventually die, can you give me some tips on growing these trees. Yours are so beautiful. Thanks! A couple of pointers. In your climate 50% shade, especially in the heat of the day or at least half of the day will help. Secondly, they hate wet feet, they love well drained soil or raised beds. Do not plant it too deep. You should only have about 1-1/2″ of soil over the root ball, then a couple of inches of mulch over that. Don’t fertilize. They cannot deal with that much nitrogen. Some compost mixed in the soil at planting is good. I want to buy 4 Crimson Queen Japanese Maples. I want to keep them small, maximum size of about 3 feet by 4 feet. Will this work? Can I keep them small? Keeping them that short is easy, but they want to grow wide, as wide as 6′ or wider. Don’t let that discourage you. They are beautiful plants. Crimson Queen is not an upright growing tree, just trim the top to keep the tree neat and uniform. Upright trees can also be kept smaller by simply trimming the top at least once a growing season. I live in south central Missouri and planted a 3′ tall Crimson Queen last year. It has no afternoon shade, and the leaves on the topmost branches turned brown and fell off. The branches they were attached to also died, so I cut them off this Spring. It is now getting new growth where the branches were removed. A green leafed maple is coming from the base of the tree and is growing rapidly. Will it harm the Crimson Queen to allow this one to grow up through the canopy and shade the Crimson Queen? More than likely the damage to the maple tree was winter damage and not sun. Yes, the seedling or sucker that is coming up will ruin the tree, I for sure would remove it. 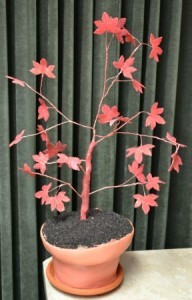 Can I prune a crimson Queen Japanese maple to different shapes as maybe you would with a bonsai tree? You can, you certainly are not going to hurt the tree. Why are the leaves on my Crimson Queen got holes on it and scorching? Is it because of to much sun? The tree is still in a nursery 7 gallon pot. I just bought it a few weeks ago. The tree is in my backyard and ít facing east. It’s not unusual for dissectum maples to show a little scorching on the leaves in the summer. But being in a pot makes it worse, they dry out very easily in containers. I got a crimson queen this spring, it’s bare on one side. How do I get new growth in that side. Just keep it pruned on the other sides to keep it balanced, it will fill in. You can prune it at any time of the year. I just planted a crimson queen this year and the leaves look dry and also look like there is a white dust on them. What is wrong? The tree could have dried out, but the white powder sounds like powdery mildew for the heat and humidity. Not much to be concerned about, just water as needed and it should look great next year. I live in Ohio. I planted a 3 ft crimson queen in the summer. It is now the first of November and all the leaves fell off. The tree is planted on the north side of the house. Shade in the morning and afternoon sun. The branches do not seem to be brittle. Is my tree DEAD? Probably not. There are a couple of things to think about when you planted the tree. 1. Is the tree planted at the right depth? The root ball should be just a little bit higher than grade. Never lower than grade. 2. Is the tree planted in a wet area. Japanese maples hate soggy roots. 3. Did you keep it watered over the summer? It was really hot and dry. 4. Did you fertilize the tree? Japanese maples just can’t use much fertilizer. I never fertilize the plants in my landscape, just just don’t need it. I’m guessing your tree just defoliated a little bit early. This is how you test to see if a plant, or a branch on a plant has died. Just scratch the bark of your plants with your finger nail. If the tissue below the bark is green and firm your plants are fine. If the tissue is brown and mushy that part of the plant is dead. I live in a condo and cannot have a tree over 6-ish feet. Am I able to maintain the height of the tree to that level? Any laceleaf, dissectum Japanese maple like Crimson Queen can easily be maintained to a height of about 42″. I just bought a small Japanese maple to put in an area that is shaded and probably gets about two hours of sun a day. Is that enough to keep the tree alive? I’m sure it will stay alive but it won’t thrive and it will lose most of it’s red color. Thanks for the response. How many hours at minimum does the tree need? I want more than one crimson tree…how far apart should I plant them? They will get lots of sun and will be in the line of underground sprinkler system. I am in East Texas. I’d say at least 15′ apart, 20′ or even 50′ would be better. They’d look better set apart accented with other small growing plants. We ought our house three yrs ago. in the front yard is a beautiful Crimson Queen Japanese maple tree. our first two yrs in the home it was beautiful but these last yr it seems like the tree is dead . there are no leaves or any color for that matter. its still standing but seems to have no life ?is there anything we can do to save it?? Probably not, I wonder if the area is too wet, that’s usually the issue when a seemingly healthy Japanese maple suddenly dies. I have a 3 ft tall Crimson Queen Japanese Maple that has to be moved. Can it be grown in a large half barrel planter? How large will it grow? What size planter would work? The only other in ground option is an area that does not drain well due to heavy clay base with late afternoon sun – after 4 pm. Any advice you can give me is appreciated. I’m not a big fan of Japanese maples in pots, but it can be done. I just don’t know for how long. It would be far better to build a raised bed and then plant it in the raised bed. Help. We planted our Japanese maple last year and it did very well and seemed happy. This year, out of the blue, the leaves suddenly seem to be shrivelling. I can see it is in deep distress. We are in Montreal and we have had a lot of rain this spring and a wet summer too. It is in full sun though ….. What shall I do? Move it somewhere else? I’m feeling at a loss to help..
You have to determine whether or not it’s too wet where it is or planted too deep in the hole, or a combination of both. If so, at the very least raise it. But maybe it dried out in the hot sun and just needs water. You have to get your hand into the soil to see how the soil is. Also pull the soil back on top of the root ball to find the crown, the point where the roots begin. It could be too deep in the hole. about gardening. How do you kill grass and weeds without damaging plants? Is there a safe herbacide to use? Or should I just try to pull them? I had a Crimson Queen planted last year in early May. I do have a unfair amount of clay so the landscaper dug a large hole and filled with dirt. When June came my tree turned green and displayed lackluster color in the Fall. The leaves never dropped and as of this writing are still on the tree. It’s planted on the East side of my home and occasionally my sprinkler system waters it in the summer. I may have overwatered it last year, it was dry, but I’m not sure this is the reason for it turning green and still holding its leaves. I live in the NW suburbs outside of Chicago. Hope this is enough information, it certainly is a quirky shaped tree! Last fall Japanese maples all over the country hung on to their leaves in the fall and through the winter. I’m not sure why, curious to see how they fair this summer. In your clay soil you have to be really, really careful to not over water that Japanese maple. If too wet it simply will not survive. See what it does in the spring. I have an 18 year old Crimson Queen that has always thrived. two years ago a lot of the leaves looked like they were dying/dry, but it came back without any issues in the spring. There were a lot of very short dried branch tips, but that was it. This spring most of the top of the tree did not bud and there are now almost no leaves on top. Should I prune it back on top? Is it dying? Don’t prune anything until you do a scratch test. At this point I don’t have an explanation, but let’s wait and see if we see more of this. I’m afraid we will. This is how you test to see if a plant, or a branch on a plant has died. Just scratch the bark of your plants with your finger nail. If the tissue below the bark is green and firm your plants are fine. If the tissue is brown and mushy that part of the plant is dead. Your tree might be in trouble. Back filling around a Japanese maple with pourous material allows water to easily enter the space around the root ball, but no way for the water to escape. A better option would have been to raise the bed and plant the tree high. If it were me I’d make this change before the tree gets in trouble. I am planting a crimson queen in clay/sandy soil in Denver, CO. I have read all of your expert tips and wonder if you would summarize your top three planting tips for me, please. I completely understand the watering (overwatering) advice and will follow suit. Plant it at least one if not two inches higher than you would think so the top of the root ball is above grade. Do not over dig the hole and or back fill with stuff that did not come out of the hole. Apply 2″ of mulch, do not fertilize. And make sure the area is not wet. I planted a Crimson Queen two years ago and it has never achieved that dark crimson color I desire. It is a drab green with new growth being of a darker crimson color. Those new shoots, however, turn to a more greenish hue as they mature. IS THERE ANYTHING THAT CAN BE DONE, BY FEEDING, THAT WOULD RESULT IN THE DEEPER CRIMSON COLOR OVER THE ENTIRE TREE? It is a healthy 5-foot tall tree that lives in full sun 2/3s of the day and gets sufficient water. ANY suggestions will be greatly appreciated. I really don’t think you can do much to change the color of the tree. Some years color is better than others, but it is possible that the tree you got wasn’t actually Crimson Queen. ???? ?